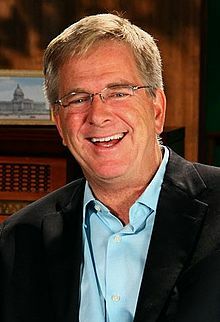 Rick Steves (born May 10, 1955) is an American travel writer, author, activist and television personality. Since 2000, he has hosted Rick Steves' Europe, a travel series on public television. Steves also has a public radio travel show called Travel with Rick Steves (2005−present) and has authored numerous travel guides. Steves started his career by teaching travel classes through The Experimental College, a student-run program of non-credit classes at his alma mater, the University of Washington, and working as a tour guide in the summer. At the time, he also worked as a piano teacher (his father had owned a piano store). In 1979, based on his travel classes, he wrote the first edition of Europe Through the Back Door (ETBD), a general guide on how to travel in Europe. Steves self-published the first edition of his travel skills book ETBD in 1980. Unlike most guidebook entrepreneurs, he opened a storefront business. Initially, this was both a travel center and a piano teaching studio. He held travel classes and slide show presentations, did travel consulting, organized a few group tours per year, and updated his books. He did not provide ticket booking or other standard travel agency services. He incorporated his business as "Rick Steves' Europe Through the Back Door." The store was in Steves' hometown of Edmonds, Washington, north of Seattle. The company's headquarters are still in Edmonds. Steves' first television show, Travels in Europe with Rick Steves, debuted on public television in April 1991 and ended production in 1998. His second show, Rick Steves' Europe, debuted in September 2000, and has aired episodes through 2018, though because he does not produce a season every year, this accounts for ten seasons. Rick Steves' corporate headquarters in Edmonds, Washington. Steves advocates independent travel. His books and media deal with travel mainly in Europe and are directed at an American audience. As host, writer, and producer of the popular and long-running American Public Television series Rick Steves' Europe, and through his travel books, he encourages Americans to become what he calls "temporary locals." He encourages his readers and viewers to visit not just major cities but also cozy villages away from popular tourist routes. Steves's television series, guidebooks, radio shows, mobile applications, and his company's European escorted bus tours attract fans known as "Rickniks". Steves's relationship with public television began in 1991 with his first series, Travels in Europe with Rick Steves. Since then he has become one of public television's top pledge drive hosts, raising millions of dollars annually for stations across the U.S. He writes and co-produces his television programs through his own production company, Back Door Productions. Tourists in Italy encounter Rick Steves on a backstreet, using his book as a guide. Since self-publishing his first book in 1980, Steves has written country guidebooks, city and regional guides, phrase books, and co-authored Europe 101: History and Art for Travelers. His guidebook to Italy is the bestselling international guidebook in the U.S. In 1999, he started writing in a new genre of travel writing with his anecdotal Postcards from Europe, recounting his favorite moments from his many years of travel. Steves's books are published by Avalon Travel Publishing, a member of the Perseus Books Group. In 2009, Steves published the book Travel as a Political Act, a guide on traveling more thoughtfully. In addition to his guidebooks and television shows, Steves has expanded into radio, newspaper and mobile applications. In 2005, Steves launched a weekly public radio program, Travel with Rick Steves. Focusing on world travel, although with a heavy emphasis on Europe and North America, each program has a guest travel expert for interviews, followed by call-ins with questions and comments. In 2006, Steves became a syndicated newspaper columnist with his Tribune Content Agency column. In 2010, he launched the mobile application Rick Steves' Audio Europe, a library of audio content (including self-guided walking tours) organized into geographic-specific playlists for the iPhone and Android. Politically, Steves has identified himself as a member of the Democratic Party, and publicly endorsed Hillary Clinton's 2016 presidential campaign. Steves is a vocal proponent of legalizing cannabis and an active supporter of efforts to reform cannabis policy in the U.S. According to Steves: "Like most of Europe, I believe marijuana is a soft drug, like alcohol and tobacco. Like alcohol and tobacco, there is no reason why it shouldn't be taxed and regulated. Crime should only enter the equation if it is abused to the point where innocent people are harmed." Steves serves on the Advisory Board of the National Organization for the Reform of Marijuana Laws. He was also a major supporter of Initiative 502 to legalize, tax, and regulate cannabis in the state of Washington. Steves hosted an ACLU-sponsored educational program called Marijuana: It's Time for a Conversation, which was nominated for an Emmy. Steves also supports solutions to homelessness. In 2005, he constructed a 24-unit apartment complex in Lynnwood, Washington, called Trinity Way and administrated by the local YWCA, to provide transitional housing for homeless mothers and their children. In 2017, Steves donated that $4 million apartment complex for homeless women and kids to the YWCA. Members of the Edmonds Noontime Rotary Club help maintain the buildings and grounds, providing everything from furniture to flowers. The club also raised $30,000 to build a play structure for the children there. Steves also raises funds for the hunger advocacy group Bread for the World. A supporter of the arts, Steves gave US$1 million in 2011 to the Edmonds Center for the Arts and Cascade Symphony Orchestra. I think we're 300 million people and if we lose a few hundred people a year to terrorists, that doesn't change who we are and it shouldn't change the fabric of our society. Frankly I think we should get used to losing—as long as we're taking the stance in the world of being the military superpower, you're going to have people nipping at you. And if it's hundreds or thousands—we lose 15,000 people a year to have the right to bear arms and most people think that's a good deal, year after year. We spend 15,000 people for the right to bear arms. What do we spend to be as aggressive and heavy weight on this planet? We're always going to have terrorism." In Travel as a Political Act, Steves wrote that displaying the American flag on car antennas "creates a fearful, schizophrenic dynamic that may stoke today's terrorism and tomorrow's international conflicts." In 2017, Steves posted on his blog, stating that he would donate $1 for every $1 spent on his website on Inauguration Day to the ACLU. According to Steves, the website had higher traffic than usual and that customers purchased $42,962 in merchandise. As a response, Steves wrote a check for $50,000 to the ACLU and stated: "Those of us with passports and who are wealthy enough to travel a lot — especially white, straight, Christian males like me — don't often think a lot about civil liberties ... at least, not in an immediate or personal way. Civil liberties just aren't an issue for most of us. If a wealthy person is in trouble with the law, he can hire a good lawyer. It's the poor who are filling our prisons. If I want to smoke pot, no one's going to arrest me. It's poor and black people who get arrested, and then disenfranchised. I have a voice because I fit societal norms and I have money." Steves is an active Lutheran and has written and hosted educational videos on subjects such as Martin Luther and the European Reformation. Steves supports liberation theology. He has been a speaker for the Lutheran Peace Fellowship. Steves is of Norwegian ancestry. His sister Jan Steves is an Iditarod racer. He was married to Anne Steves until 2010, when they divorced. They are the parents of two adult children. Their son Andy Steves followed his father's footsteps and founded his own travel company, Weekend Student Adventures Europe, and wrote Andy Steves' Europe: City-Hopping on a Budget. Steves spends about a third of every year in Europe researching guidebooks and filming TV shows. His home and his Rick Steves' Europe headquarters are in Edmonds, Washington. ^ Holtz, Jackson (March 8, 2006). "Rick Steves built travel biz through the back door". USA Today. ^ Potter, Everett (June 19, 1994). "Rick Steves takes you to 'Europe Through the Back Door'". Lakeland Ledger. ^ "Contact Us". Rick Steves' Europe Through the Back Door. Retrieved June 25, 2011. ^ "Rick Steves' Europe: Series Info". Thetvdb.com. Retrieved 2016-06-26. ^ "Travels in Europe with Rick Steves". IMDb.com. Retrieved 2016-06-26. ^ "Rick Steves' Europe: Complete Episode List". Thetvdb.com. Retrieved 2016-06-26. ^ Corbett, Sara (July 4, 2004). "Rick Steves's Not-So-Lonely Planet". New York Times. Retrieved June 25, 2011. ^ Molnar, Jim (February 14, 1999). "Travel Books -- Two Takes On Touring Europe". The Seattle Times. ^ "Rick Steves' Europe articles". Tribune Content Agency. Retrieved 9 October 2018. ^ Steves, Rick (July 29, 2016). "Top Ten Reasons I'm With Her". Rick Steves' Travel Blog. ^ "It's Time for a New Approach to Marijuana". ricksteves.com. Retrieved July 13, 2018. ^ a b "Meet the Marijuana Moneymen". Willamette Week. 29 July 2014. Retrieved 2 February 2016. ^ a b "Advisory Board: Rick Steves". NORML. Retrieved December 6, 2015. ^ "Sponsors". New Approach Washington. Archived from the original on June 25, 2011. Retrieved December 6, 2015. 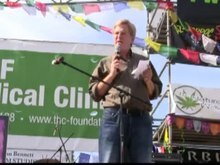 ^ "Rick Steves Nominated for EMMY as Host of "Marijuana Conversation"". ACLU of Washington. November 20, 2009. Retrieved July 13, 2018. ^ Steves, Rick. "Travel, Budget Beds, and the Homeless". ricksteves.com. Retrieved July 13, 2018. ^ "Trinity Way". YWCA. Archived from the original on February 17, 2016. Retrieved December 6, 2015. ^ "Rick Steves' Europe: Social Activism". Ricksteves.com. Retrieved 2012-12-09. ^ "Rick Steves Europe: Rick Steves Donates $1 Million to Edmonds Center for the Arts and Cascade Symphony Orchestra". Ricksteves.com. Retrieved 2012-12-09. ^ Postman, David (September 13, 2006). "The RIck Steves Guide to terrorism in the world". Seattle Times. ^ Steves, Rick (2009). Travel As a Political Act (Kindle ed.). New York: Nation Books. Kindle location 1640. ^ Steves, Rick. "Keeping America Great Together: $50,000 to the ACLU". Rick Steves' Europe. Retrieved 25 January 2017. ^ Steves, Rick (2009). Travel As a Political Act (Kindle ed.). New York: Nation Books. Kindle location 123-30. ^ Steves, Rick (2009). Travel As a Political Act (Kindle ed.). New York: Nation Books. Kindle location 1833-39. ^ "A Panorama of Witness and Struggle - Lutheran Peace Fellowship through the years". Members.tripod.com. Retrieved 2016-06-26. ^ "Finding My Norwegian Roots by Rick Steves". ^ Steves, Rick (February 27, 2012). "The Iditarod: My Sister, Jan Steves, Mushes with the Best Dog Racers in the World". ricksteves.com. Retrieved July 13, 2018. ^ "Weekend Student Adventures Europe".